← Slave Labour Code: Unlimited rights to the Drafting Team ! The Drafting Committee of the Constitution Vs. The Drafting Team of the Labour Code ! 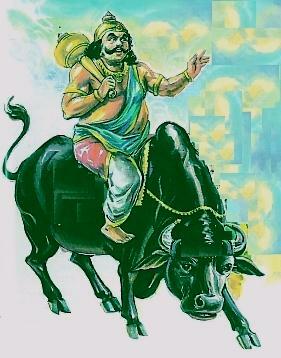 Lord Yamadharma Raja was taking rounds of the universe. 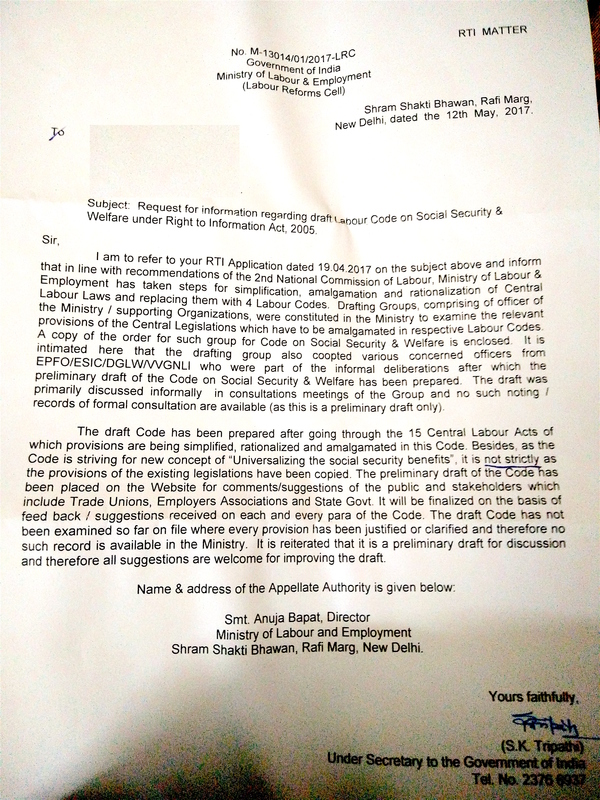 Suddenly, the Lord stumbled upon the letter dated 12.05.2017 of the Ministry of Labour & Employment which explained the modus operandi adopted by the Drafting Team of the Labour Code put out in public domain on 16.03.2017. He was shocked. He immediately ordered Chitragupta to convene an Emergency Session of His House for discussing the issues involved. The anxious Lord, in a state of shock, rushes for the Emergency Session ! The House is already full, when the Lord arrived there. All the invited participants, brought in both from the otherworld and netherworld, remain assembled there carrying a copy of the MOL&E letter dated 1205.2017 in their hands. On His being seated, the Lord searches for B.R.Ambedkar and looks at him. Ambedkar rises up and explains his understanding of the letter dated 12.05.2017 of the MOL&E. Ambedkar: My Lord! I understand the unease of the Lord. I was also shocked on seeing this letter dated 12.05.2017 of the MOL&E and the liberty, allegedly, given to the Drafting Team of the Labour Code. I had been the Chairman of the Drafting Committee of the Indian Constitution itself. I know for sure that I had never had this kind of liberty to write the Constitution in the manner in which I wanted. The Drafting Committee went about its way on the basis of the Objectives Resolution moved by Jawaharlal Nehru on 13.12.1946 and adopted unanimously by the Consembly on22.01.1947 (Note **1). There must be some guidelines and specific parameters to be given to every Drafting Committee by the legislature. The Drafting Committee must work within that frame work. But, the letter of the MOL&E shows that the Drafting Team of the Labour Code had not been given any such legislative guidelines. This Drafting Team had prepared the draft Labour Code without even understanding the fact that it is snatching away the already existing benefits to the working population. What is even more shocking is that the Ministry has come to town with this incomplete draft and are asking the people to explain their stand on it, without telling the people why and where they have made changes, additions, deletions and insertions. If the team had done its work for bona fide reasons, it would have given appropriate explanatory Notes with reference to each and every section in the draft Labour Code, as foot note on every page, to invite the attention of the readers to understand the modifications done. These are rudimentary principles of legislative drafting. But, the Drafting Team of the Labour Code has not done so. I feel that the manner in which the MOL&E is repeatedly attempting at justifying this slipshod work, shows that the Drafting Team is not at fault. But, there is an invisible force which is driving the Drafting Team to write the draft Labour Code, the way it has been done. Because, left to them, the officers would not venture into such misadventures. They would go by procedures laid down. For, they know they are accountable, otherwise. Jawaharlal Nehru: Yes, My Lord ! Ambedkar is right. These are rudimentary principles of law making. The Chairman of the 17th Law Commission of India, Mr. Justice. M. Jagannatha Rao, has written a paper on Legislative Drafting. He says, “The draftsman is not the author of the legislative policy, he merely tries to transform the legislative policy into words. The legislative policy is made by the political executive which belongs to the political party which is ruling the legislature or by the monarch who reigns over the country. The draftsman must, therefore, digest the legislative policy fully before he produces the instrument of legislation which can achieve the legislative purpose”. The issue here, with the Labour Code, is why the Drafting Team does not make the concerned ‘legislative policy’ public. Vallabhbhai Patel: My Lord ! The draft Labour Code is aimed at reducing the benefits already provided to the working population. The party in power, therefore, does not want the people to know the truth. That is why the draft Labour Code has been prepared without explanatory notes. Now, they would propagate and claim that they are ensuring transparency by putting their draft on the website and inviting objections and suggestions. But, they have hidden their intention from being easily known to the public, by not providing explanatory notes for the omissions and commissions. The people behind this draft Labour Code are clever and enjoy their cleverness, tact and tricks. But, they do not have empathy towards the working population. That is definite, as could be seen from the contents of the draft. Lord: But, the MOL&E refers to the Report of the Second National Commission on Labour and tries to claim that the draft Labour Code is “in line with the recommendations of” that Report. Can’t you treat that Report of the Second National Commission on Labour as the ‘legislative policy’ ? Patel: We cannot, My Lord! Nowhere in the report of the Second National Commission has it been recommended to reduce the Dependants Benefit from the present 90 % to 50%. Nowhere has it been recommended to stop giving benefits to the employees who sustain Employment injury when they work to meet certain contingencies, as mentioned in Sec. 51-B to Sec. 51-E of the ESI Act, 1948. Nowhere has it been recommended to include an omnibus exemption clause as Sec. 1.8 to enable every employer to get exemption from the entire Labour Code itself. There are many such dangerous provisions in the draft Labour Code. I am certain that these have been inserted only with diabolical intentions to make the ultra-rich people to make money by exploiting the downtrodden segments of the society. The intention behind this Labour Code is mala fide. Lord: But, the reply of the MOL&E dated 12.05.2017 shows that the “Code is striving for a new concept of ‘Universalising the social security benefits”. How can you say that the intention is mala fide? Patel: My Lord ! Universalisation of social security benefits was the aim and purpose of the ESI Act, It was specified thus in Sec. 1 (4) of the Act in 1948 itself. But, the progress has to be gradual and the scope for malingering must be negligible. But, without concentrating on running the ESI Scheme corruption-free, the rulers permitted thousands of crores of rupees from the accumulated funds looted, in the name of setting up medical institutions. Construction wing was one are in which rampant corruption was there in the ESIC. Even the CAG had pointed it out in his report No. 40 of 2015. But, the fact was that the CAG has also been cheated that he could not assess the real extent of corrupt activities. What is more? The Ministry of Labour, instead of filing proper counter in the court of law, wants to extricate itself by claiming that implicating the MOL&E and the Cabinet Secretary in the Writ is a case of misjoinder. These incidents would show that the rulers do not have any real concern about the loot of the public money. Their only concern how to help the ultra-rich to make money in the name of insurance by winding up social security measures. Lord: Yes, the CAG report shows the extent to which the authorities had gone to spirit away the public money. But, how do you say that the rulers want the entry of private players in the field of social security? Patel: Yes, My Lord! The word PPP used in the presentations on 02.05.2017 and the manner in which Sec. 88.2, Sec. 89.1. Sec. 90 – 93 have been worded, show not only the desire of the rulers to bring in private players but also the willingness of the rules to provide safe escape route to the defaulting private players, if and when they are caught for their misdemeanour. This is a clear case of rulers aligning with the ultra-rich to exploit the poor. The intention behind such loosely worded clauses can never be for bona fide reasons. Moreover, although it is said that 15 laws are amalgamated, the 16th law, the Pension Fund Regulatory and Development Authority Act has also been brought in. It is only for the purpose of allowing private players to play with social security. Nehru: My Lord ! The intention is to bring in private players into social security. This is in violation of Art. 41 also. But, the rulers do not care. The pressure from the ultra-rich lobby is not able to be resisted by these rulers. That lobby is not able to provide matching benefits, as given by the ESIC. So, they want to weaken the ESIC and make it vanish. The present day rulers are bending backwards to oblige these private sharks. Instead of working for the welfare of the masses, the present rulers want to make the ultra-rich even richer. Adharkar: My Lord ! The private players invoke ‘Exclusion Clause’, for Pre-existing diseases. But, the ESIC does not have any such prohibitory clauses. So, the private players and the brokers engaged by them work overtime to wind up the public institutions that provide social security. The result is the present draft Labour Code. Patel: Yes, My Lord ! The nation knows how the rulers worked against the public institution, the MTNL and the BSNL, to facilitate the private players to succeed in exploiting the nation. The draft Labour Code is also intended to help the private players to make money through the social security path and that will land the nation only in a mess. It will affect the entire nation. This Labour Code is actually going to convert the labour into slave labour. Already, the rulers have made that attempt through the Bill for safety and health of workers. It has enabled the employer to crush the workers to work longer time in the name of overtime. This Labour Code will make the people of the nation suffer to a great extent. Lord: But, I find from the letter dated 12.05.2017 of the MOL&E that it is only “a preliminary draft for discussion and, therefore, all suggestions are welcome for improving the draft”. Ambedkar: My Lord ! That is an attempt at cheating the public. Let them publish the legislative policy on which the Drafting Team worked to prepare this draft. Let them publish the draft Labour Code with proper explanatory notes for each and every section where omissions and commissions have been made with reference to the existing statutes. Unless and until they do so, the claim of the MOL&E that they are welcoming suggestions is nothing but a technique to hoodwink the public. The public should not and cannot be expected to find out where this Drafting Team has hidden what, especially when the Drafting Team has hidden so many things at so many places in the draft Labour Code. The very absence of the legislative policy and the explanatory notes in the said Code is an indicator of the mala fide intention of the people who made the Drafting Team to prepare the draft thus. My Lord ! The Drafting Team is only a hack. But, it has allowed itself to be a hack unwillingly due to undue influence. I recall that I had, on 04.11. 1948 said in the Parliament of India, “I hope the Drafting Committee will be found to have faithfully carried out the directions given to it” (Note **2) . Saadullah, another member of the Drafting Committee said, “We were merely to dress up the Objectives Resolution. How can 7 members thrust their opinions on 308?” (Note **3). And I remember the discussion in the Parliament on 02.09.1953, when I advocated the carving out of Andhra Pradesh and condemned the manner in which Potti Sriramulu was driven to death for that. At that time, I said, “My answer is that I was a hack. What I was asked to do, I did against my will” (Note **4). Again on 19.03.2015, I said, “I and the Drafting Committee take no responsibility for that. It is not our draft” (Note **5). But, My Lord, the Drafting Team of the Labour Code, according to the MOL&E, has done everything on its own, without ny legislative policy even. Lord: Oh ! What a power to the Drafting Team of the Labour Code !! You say you did not enjoy any such power while drafting the Constitution itself !! Can we say that the Indian democracy has progressed to such an extent that it devolves unlimited powers to Drafting Teams? Adharkar: My Lord ! It shows their progress in enacting regressive laws. The mala fide intention is explicit, My Lord! The extent of liability of contribution has been shifted from subordinate legislation [ESI (Central) Rules, 1950] to the primary legislation, the Labour Code itself. But, the benefit provisions assured in the primary legislation (Sec. 51-B to 51-E of the ESI Act, 1948) have been made to vanish. The MOL&E cannot defend itself saying that they would provide for more, through their proposed subordinate legislations like Schemes, Rules, Regulations and Licences, than what is available now to the working population. Patel: What is even more shocking is the manner in which both the provisions of the Employees’ Compensation Act, 1923 and Employees’ State Insurance Act, 1948 have been allowed to remain in a single statute. That certainly is a regressive method of enacting law for the welfare of the working class. The employees will be allowed to choose between either. That will not be in the interest of workforce. (A hand is rising in the crowd. The Lord looks in that direction. It was Golwalkar who raised his hand. The Lord nods at him.). Golwalker: My Lord ! The information conveyed through the letter of the MOL&E letters dated 24.04.2017 and 12.05.2017 is not true. The Drafting Team must have had a specific and concrete legislative policy. But, that is a secret document. The officers, otherwise, would not have ventured (i) to reduce the established benefits, (2) to bring in private players in the name of Intermediate Agencies, (3) to drop the word ‘substantially’ in the sly, (4) to insert provisions for subsidy to employers, (5) to provide for escape route to fraudulent private players through weak punishing mechanism, etc., Five officials drafted for the work on 12.03.2015 cannot be said to have invented a totally new system. Hedgewar: Yes, My Lord! There must have been specific direction given to the Drafting Team regarding the direction in which it should move. Most probably, the direction was to combine all the 15 welfare legislations and make a mess of it in such a way the people do not understand how private players are going to be benefitted at the cost of the workers. That must alone have been the direction given to the team. Ambedkar; Yes, it must have been only like that. But, that was not the legislative policy, My Lord! There is no such document physically available. Patel: My Lord! The present set of rulers are more interested in social re-engineering than in the welfare of workforce. That is why they meddle with Labour Laws to make them nothing. That is why they pretend that they do not have any legislative policy. This Labour Code, is projected by the MOL&E as the brainchild of five officers in the Drafting Team. No team of officers would venture thus. Moreover, this Labour Code is nothing but a recipe for disaster. It will not bring in Social Security but only social unrest. Earlier, in April, 2016, without any objective outlook, these rulers brought in a legislation to amend the EPF provisions. That resulted in the masses rising up in a leaderless protest. The rulers beat a hasty retreat, immediately. Now, they want to reduce the benefits even more. They are not responsive or accommodative or sympathetic to the working population. They are driven by the ultra-rich businessmen and are ready to placate them by going to any extent. Adarkar: My Lord, please save India from the proposed Labour Code ! Note **1: The Constituent Assembly met for the first time on 09.12.1946. All the members were present. On 13.12.1946, Jawaharlal Nehru moved the Objectives Resolution in the First Session that ended on 23.12.1946. The Objectives Resolution was unanimously adopted by the Consembly on 22.01.1947 in the Second Session that started on 20.01.1947. The progress got affected because of the partition plan in June 1947. But, the Objectives Resolution remained as it was. And it was on On 29.08.1947, the Constituent Assembly set up a Drafting Committee under the Chairmanship of B.R. Ambedkar to prepare a Draft Constitution for India. The Drafting Committee went about its mission on the basis of the said Objectives Resolution and the discussions and resolutions in the Constituent Assembly during the period between 09.12.1946 and the discussions in the four, technically five) sessions of the Consembly that preceded the setting up the Drafting Committee. This Objectives Resolution defined the parameters within which the Constitution that was to be drafted should be prepared. Note **2, Note **3, Note **4 & Note **5: Page 33 – Introduction to the Constitution of India – Brij Kishore Sharma. Image of Lord Yamadharma Raja : Courtesy, web.